Today I have a fantastic, honest, and funny episode of The Lively Show for you! 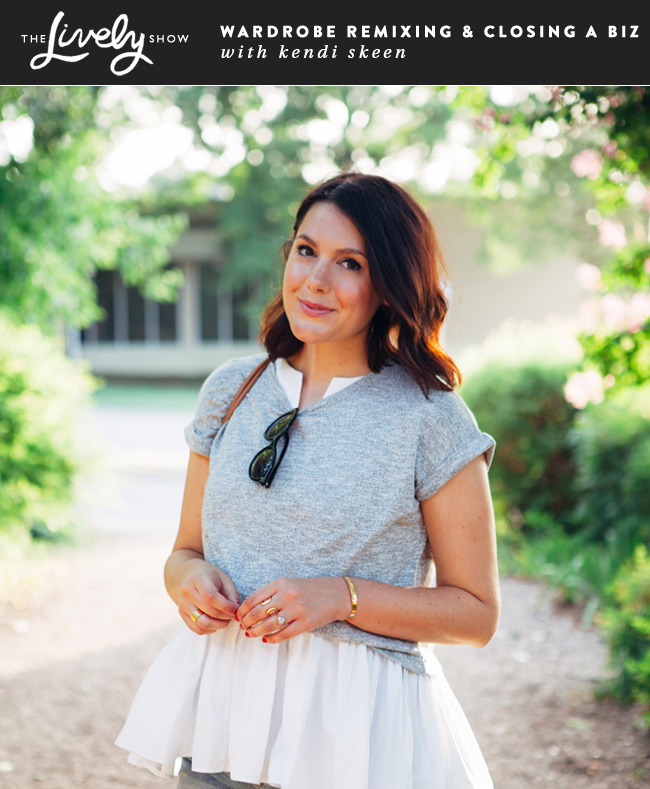 I’m talking with Kendi Skeen, the face behind the popular fashion blog, Kendi Everyday, and the owner of a boutique called Bloom in McKinney, Texas. We are chatting about wardrobes, where to spend your clothing budget, how to remix your wardrobe, and her career and business transitions. Kendi has gone from a full-time job, to running her blog full-time, to opening a store, and recently to closing that store. In this episode she shares candidly what she did right, what she did wrong, and what she’s learned from this experience. Plus, she’s sharing what she’s working on next. This episode is perfect for anyone looking to improve their wardrobe, handle career transitions better, or start (and close) a business. How Kendi’s popular 30 for 30 started and grew. Where to invest your wardrobe budget. (25:00) How Kendi transitioned from her full-time job to running her blog full-time. The action steps Kendi took open her brick and mortar store, Bloom. Why Kendi and her husband, Bryan, lived with her parents for two years. What Kendi wishes someone would have told her when she began Bloom. The pressures Kendi felt as a blogger building a store. Why Kendi closed Bloom earlier this year. How Kendi discovered the next chapter for Bloom and her career. What Kendi would tell someone just starting out on this journey. Want more? Check out past Lively Show episodes here. PS – If you find this podcast helpful and would like to share, please leave a review on iTunes. Thank you so much!